In light of Evo Morales’ May Day expulsion of USAID from Bolivia, here is a look back to the Harry Truman administration’s work to undermine Bolivia’s transformative National Revolution in 1952. This history’s legacy lives on; Washington’s power is woven into the fabric of Bolivian politics, from the dreams and nightmares of the National Revolution, into the MAS era of today. Author’s note: At a May Day speech this month, Bolivian President Evo Morales announced that his government would be expelling the United States Agency for International Development (USAID) out of the country for seeking to undermine the leftist policies and agenda of the Morales government. As I wrote in an investigative article on this topic in 2008 for The Progressive Magazine, the US government has for years been attempting to oppose the Movement Toward Socialism (MAS), the political party of Morales, and weaken Bolivia’s leftist social movements. Washington is no stranger to interfering in leftist and nationalist politics in the Andean nation. As the following paper, originally published in the University of Vermont History Review in 2012, outlines, the Harry Truman administration worked against the progressive policies, self-determination and grassroots base of Bolivia’s transformative National Revolution in 1952. This history’s legacy lives on; Washington’s power is woven into the fabric of Bolivian politics, from the dreams and nightmares of the National Revolution, into the MAS era of today. At the beginning of the Cold War, Bolivian miners and peasants took to the streets in what would become one of the most transformative and symbolically-rich political events of the twentieth century for the Andean nation. 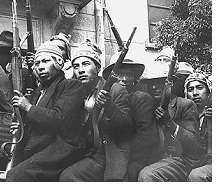 Bolivia’s National Revolution in 1952 initiated shockwaves that are still felt among the country’s impoverished and indigenous majority. From land reform and the nationalization of the tin mines, to expanding access to voting, education and healthcare, the changes and promises wrought by the National Revolution were historically unprecedented for Bolivia. Public support for the National Revolution was fed by many Bolivians’ dissatisfaction with working conditions in the fields and mines of the nation and the country’s widespread social and economic inequalities. A testimony from Bolivian miner Domitila Barrios de Chungara conveys the perception of injustice that was common among Bolivian workers at the time of the revolution: “Why should we allow a few to benefit from all of Bolivia’s resources while we go on forever working like animals, without having higher aspirations, without being able to provide a better future for our children? Why shouldn’t we aspire to better things when our country is rich thanks to our sacrifice?” Barrios de Chungara’s complaints illustrate the rage felt by many poor Bolivians, a rage which gave expression to the demands of the revolution. Yet, in the months and years following the uprising, many of the National Revolution’s promises remained unrealized. A string of military dictatorships, corrupt presidents, racism and vast inequality in the country contributed to these challenges. But a look at Washington’s response to the revolution in 1952 points to some other roadblocks to development and social change. This essay explores the ways in which President Harry Truman’s administration undermined the historic nationalist changes that took place during the National Revolution in Bolivia. In the US fight against communism in the Cold War, the decisions of leading Truman administration foreign policy officials working on Latin America were consistently informed by US commercial interests. Such US policy fought against nations who challenged those commercial interests in their own countries by way of the state-led expropriation of private businesses, industry and land. Diplomatic cable exchanges between government officials and diplomats in Washington and La Paz detail how the Truman administration worked against the self-determination of Bolivia’s National Revolution. Of specific interest here is the extent to which the Truman administration, following Bolivia’s nationalization of tin mines, pressured Bolivian officials into reimbursing the private businessmen who were the former owners of the government-expropriated mines, a move that was against the popular sentiment of the grassroots base of the Bolivian revolutionary government. Considering the roots of the Truman administration’s foreign policy in the wake of World War II, and the development of the Truman Doctrine, the administration’s response to the National Revolution took place at an important juncture in US-Latin American relations. In the years following Bolivia’s revolution, Washington notoriously helped orchestrate bloody coups against leaders with nationalist leanings elsewhere in the region. The way in which Washington dealt with this earlier threat to US hegemony in the Andes sheds important light on the machinations of US foreign policy in Latin America in the early Cold War. Coming out of the commercial, economic and political disruption of the Great Depression and World War II, Washington sought to mend crises and prevent further decay in relations with Latin America through the Good Neighbor Policy, which essentially served as an “international counterpart of the New Deal.” The Good Neighbor Policy was aimed at developing a more reciprocal trade relationship with Latin America, a departure, at least rhetorically, from the more interventionist policies of many previous US administrations. While directed toward developing more equal economic and political partnerships between Washington and the governments and people of Latin America, the Good Neighbor Policy was also aimed at expanding US influence, commercial presence and political power in the region. US President Herbert Hoover, elected in 1928, was considered one of the fathers of the Good Neighbor Policy in his plan to not view Latin America simply as a little brother. President Franklin Roosevelt expanded these neighborly policies toward Latin America, focusing on pro-trade approaches and a non-interventionist stance, which also involved cutting back on military spending due to the financial constraints imposed by the Great Depression. The Good Neighbor Policy was a shift away from the more explicitly interventionist Roosevelt Corollary, which was established in 1904 by President Theodore Roosevelt and served as an expansion of the Monroe Doctrine. The Roosevelt Corollary basically claimed that the US had the right to intervene militarily in Latin America in order to protect US commercial interests in the region, and to stabilize economies and penalize nations if they did not pay back debt to the US. The Corollary was based on the belief that if the US did not establish a strong presence in the region through intervention, then European powers would encroach on Latin America. When the Japanese attack on Pearl Harbor took place on December 7, 1941, Latin American countries rallied to resist Axis incursions into the region and supported the US in World War II, in part by breaking relations with Axis nations. The solidarity with the US on the part of many Latin American nations was due in part to a fear and disdain for the Axis Powers as well as an expectation that by supporting the US, they would receive helpful financial aid from Washington. Latin America was a war-free zone in World War II, providing much in the realm of natural resources to the US. Each year, from the 1920s and into the 1940s, the US used 160 billion tin cans and 75,000 tons of tin metal. This was roughly 45 percent of the entire global use per year. During World War II, Bolivia provided most of the tin for the US; from 1940 to the early 1950s, the US purchased nearly half of all of Bolivia’s tin ore. This tin trade was the most important aspect of US-Bolivian relations throughout the war, and would continue to be a key concern during the National Revolution in Bolivia. Truman entered office in 1945, with Dean Acheson acting as Secretary of State from 1949 to 1953. This dynamic partnership created a foreign policy legacy that continued to influence US politics for the rest of the century. During the Truman years, the US established itself as a dominant ally in Europe with the Marshall Plan. The Soviet Union posed a threat to US economic and political interests, and Truman responded to this in March 1947 by developing the Truman Doctrine, which established Washington’s objective in the post-World War II era of using political and financial support to contain the Soviet Union to prevent its further expansion. Bolivia’s National Revolution in 1952 provides an interesting case study for measuring the impact of the Truman Doctrine in its early days. The timing of the revolution was also significant in that it took place following the signing of the Rio Military Pact in September of 1947 between the US and Latin American nations. The pact involved collaborations in defense of the region, establishing that any nation would come to the defense of another in the case of a foreign intervention. Following the precedent set by the Truman Doctrine, Washington’s initial goal with its participation in this agreement was to curb the influence of communism and the Soviet Union in the region. Later, in April 1948, the Organization of American States was also established initially to protect the region from communism. The Cold War and US containment policy quickly pushed aside the more “neighborly” language and approaches of the Good Neighbor Policy as fears of Soviet Russia and communist expansion in the region took center stage. Yet perhaps more notable than the Truman administration’s concern for the spread of communism in Latin America was its general ignorance and lack of concern toward Latin America. A brief look at leading political and diplomatic officials connected to the administration illustrates this view. On February 18, 1950, George Kennan, a senior Foreign Service officer and State Department counselor, boarded a train in Washington, DC that was bound for Mexico City. Kennan was a Cold War expert on Russia whose reports from the Soviet Union helped form the US containment policy toward communism. Yet he knew next to nothing about Latin America. The US State Department sent him on this trip to assess the threat of communism in the region and how to deal with it. Condescension was typical of the Truman White House toward Latin America during the early Cold War. Leaders in Washington could afford that condescension because they were extremely powerful in the region, expected obedience from most Latin American governments, and were generally unafraid of actual Soviet interference. “They were far more concerned about nationalism, especially its economic variety, and the threat this posed to private U.S. investments,” writes US foreign relations historian Robert Beisner. The Truman administration’s work in Latin America represented an important juncture in US-Latin American relations. Not only did Truman’s time in office coincide with the years immediately following World War II, but it also represented a shift away from the Good Neighbor Policy and to the Cold War interventionism that came to define the approach of subsequent administrations toward Latin America. For example, in 1954 the socialist president of Guatemala, Jacobo Arbenz, was overthrown in a US-backed coup largely organized by the CIA under President Dwight Eisenhower. This was in response to a direct threat against US business interests in that Arbenz had expropriated land used by the United Fruit Company, a US-based company. The case of the Bolivian National Revolution, therefore, is unique in that Bolivia nationalized its tin mines, affecting US investors, but the US continued working with the country, pressuring it diplomatically and commercially rather than seeking to overthrow the revolutionary government. How Truman worked with Bolivia in the National Revolution says much about US policy in the early Cold War. 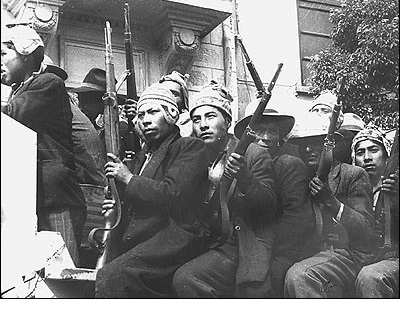 The events in Bolivia were dramatic and unparalleled in the country’s history. For Washington, it posed a challenge and opportunity to test the Truman Doctrine and continue the purchase of tin from the impoverished country. Though the revolution later transformed into a dictatorship, it began hopefully with a broad participation of society overthrowing a military ruler, and establishing long sought after rights for the impoverished indigenous majority. The National Revolutionary Movement (MNR) party grew out of the camaraderie that was established between soldiers in the trenches of the 1930s Chaco War, a bloody fight with Paraguay over land and access to oil. In its early days, the MNR was led by a multi-class coalition of veterans of the war who allied with radical students. In the months leading up the 1952 National Revolution, the MNR also drew from the vital support of miners, workers and farmers, many of whom joined the party out of impatience with Bolivia’s traditional political parties; they saw in the MNR a more inclusive and progressive set of platforms and political beliefs. In 1951, the party ran Victor Paz Estenssoro as a presidential candidate. He won a resounding victory at the ballot box, but the military would not allow him to take power; they put military General Hugo Ballivian in Estenssoro’s rightful place. After the legitimate victors were barred from entering office, the MNR decided that their only option would be armed revolution against Ballivian and his faithful supporters in the government and army. Washington at the time was keeping a watchful eye on Bolivia, monitoring developments from afar. In the lead up to the revolution, they simply waited to see how things would turn out before taking a stance on either Ballivian or the MNR’s claims to power. On April 10, 1952, Ballivian called for the lights to be put out in La Paz in order to impede the advance of the MNR rebels as they descended into La Paz from the neighboring city of El Alto. Yet a full moon lit the way, providing the rebels with guidance in their march down the steep hills from El Alto into the capital city. Many of the MNR rebels were members of the working class neighborhoods in El Alto, and so knew the terrain very well. They effectively cut off Ballivian’s forces by blocking key routes on the outskirts of the city. Conflicts flared up in the night, leaving wounded and dead on both sides. But news of the MNR rebels’ victory spread throughout countryside, inspiring similar uprisings across the nation. Three days later, with over 600 dead from the battles, the MNR was victorious over the Ballivian regime and took power. Just three days after Estenssoro took office, the Bolivian Workers’ Center (COB) pressured the new president to nationalize the country’s tin mines, expropriating the industry and natural wealth without paying the private owners of the mines. The COB also demanded that the MNR government redistribute land to poor farmers, grant citizens universal suffrage, and formalize the armed worker and campesino militias as a replacement for the military. Such demands coming from the COB and other worker and farmer movements pushed the MNR to turn the radical changes they promised on the campaign trail into a reality. On July 21, 1952, the government granted the right to vote to all Bolivians over the age of 21, bringing 80 percent of the formerly marginalized indigenous population into the electorate. Further rights were gained through grassroots pressure on powerful institutions. Campesinos and rural workers’ unions, using their weapons from the revolution, applied their own systems of justice through militias, took over land, reorganized systems of production and often superseded the power of local political authorities. As a result of the pressure from labor organizations and miners, the MNR signed a decree that nationalized the country’s tin mines on October 31, 1952. An enormous crowd of miners gathered to celebrate the signing with cheers, dynamite explosions and gunshots into the air. The festivities went on for days. The worker-run Bolivian Mining Corporation took over the operation of 163 mines and 29,000 workers formerly controlled by the three Bolivian “tin baron” families: the Patiños, Hochschilds and Aramayos. In spite of the COB’s demands not to pay the owners a cent, the Bolivian government ended up paying these families a total of $27 million to buy back Bolivia’s underground wealth. Poor, armed campesinos in various parts of the country also occupied land and pressured the government to break up large land holdings and expropriate and redistribute the land. In August of 1953, the MNR passed the Agrarian Reform Law to appease protesting grassroots organizations, but a difference remained between the rhetoric of the MNR’s policies and the actual change on the ground; on a national level, the land reform only affected 28.5 percent of large landowners. In the US, there was alarm regarding the revolution in Bolivia, but the State Department was mostly concerned about the nationalization of the tin mines as it affected US businesses. From the very beginning of the revolution in April 1952, the Truman administration was opposed to the MNR government’s plan to nationalize the tin mines. In a memorandum from Secretary of State Acheson to President Truman on May 22, Acheson argued for the US to recognize the MNR government. Acheson believed this recognition would help the moderates in power of the MNR maintain their legitimacy against more radical sectors of the government, particularly the Minister of Mines and Petroleum, Juan Lechín, a popular union organizer who was advocating vociferously for the nationalization of the tin mines. The US ended up recognizing Bolivia, but only as part of a power play to draw moderates in the government closer to US interests, leading them away from more radical voices such as that of Lechín. In subsequent correspondences both Acheson and Assistant Secretary of State for American Republic Affairs Edward Miller were primarily concerned about nationalization, how that would affect US investors in the country, and how it would be a dangerous example of nationalist policies to others in the region. On September 8, Acheson wrote to the US Ambassador in La Paz to tell the Bolivian government that the US would not purchase tin from Bolivia if the country nationalized its tin industry. This case of blackmail from the US State Department against the sovereignty of the Bolivian people demonstrates that the Truman administration was more interested in protecting US commercial and security interests than respecting the rights of Bolivia to develop its own economy in a nationalist direction. Finally, when Bolivia did nationalize its tin industry on October 31, 1952, the US State Department responded with strong recommendations that Bolivia pay back the major tin companies, including US investors. This went entirely against the will and demands of much of the organized labor in Bolivia and the indigenous and peasant population that formed that backbone of the popular support for the MNR. In the view of this significant sector, the three main mining companies had been enriching themselves through the enslavement of Bolivian people in the tin mines for decades, and that therefore the tin barons should not be compensated for their cruelty. None the less, the US demanded that the Bolivian government compensate the tin barons of the mining industry a total of $27 million, a huge sum for the impoverished government. The National Revolution in Bolivia was met with pressure from Washington, and the “reluctant revolutionaries” of the MNR responded by compensating owners of the nationalized tin mines, an approach that was unpopular among tin miners and the grassroots base of the MNR, but pleased Washington. Shortly following the compensation plan, “US officials announced that the United States was doubling its purchases of Bolivian tin and that Bolivia would begin receiving food exports.” Over the next decade, into the 1960s, the Bolivian government received a third of its funding from US aid, totaling $100 billion, a higher amount than any other country in the region received at the time. In exchange, the Bolivian government had to follow Washington’s commands. The US government used its clout as a major purchaser of tin and provider of financial aid to the poor nation to pressure the MNR government into a more moderate approach in its policies toward the tin industry. In this way, Washington was able to maintain its supply of cheap tin as well as its hegemony over the country’s politics. The Truman administration thus paved the way toward a form of intervention that was not based on covert operations or a military coup – as was the case with President Arbenz in Guatemala just two years later. Instead, Washington was able to achieve US objectives in the country through diplomatic pressure to uphold US commercial interests. The National Revolution had the momentum to place power in the hands of Bolivia’s poor majority. However, according to Barrios de Chungara, the “new bourgeoisie” in power started “undoing the revolution” in spite of the fact that the revolution was made by the working poor. “Everything’s been betrayed because we left the power in the hands of greedy people,” she said, explaining that in the end, most of the MNR’s policies just enriched a new group of elites. The MNR leadership’s distance from the rank and file of their party contributed to the unfulfilled promises of the National Revolution. Yet Washington limited the revolution’s transformative capacity as well. The Truman administration’s role in pushing the MNR away from full expropriation of the mines demonstrated a Cold War tactic of putting US commercial interests above the rights to national sovereignty in Latin America. Certainly, the Cold War did involve economic and political battles against the Soviet Union and its allies across the globe. Yet in Latin America, the Cold War was often used by Washington as simply an excuse to squash nationalism, movements against US imperialism, and governments that were seeking a more independent and defensive route within the arena of a global market increasingly dominated by the US. The case of Washington’s pressure on the National Revolution in Bolivia is illustrative of this dynamic. Just two years later, the Eisenhower administration overthrew the Arbenz government. In 1973, the US backed a military coup against democratically elected socialist president Salvador Allende in Chile, leading to a bloodbath orchestrated by the dictator Augusto Pinochet. Throughout the 1960s and 1970s, the US propped up repressive dictators in Brazil, Uruguay, and Argentina. When the socialist Sandinistas took power in Nicaragua in 1979, the US began a covert military operation against this government that lasted throughout the 1980s. These are the tragedies that came to define the Cold War in Latin America. This conflict that was ostensibly against the Soviet Union and communism was fought out in part in the streets and government palaces of Latin America. The US pressure against Bolivia in 1952 was but an early sign of this development. Benjamin Dangl is the author of The Price of Fire: Resource Wars and Social Movements in Bolivia (AK Press) and Dancing with Dynamite: Social Movements and States in Latin America (AK Press). Dangl is the editor of TowardFreedom.com, a progressive perspective on world events, and UpsideDownWorld.org, covering activism and politics in Latin America. He is currently a doctoral student in Latin American history at McGill University. Domitila Barrios de Chungara, Let Me Speak! : Testimony of Domitila, A Woman of the Bolivian Mines (New York: Monthly Review Press, 1978), 51. Mark T. Gilderhus, The Second Century: U.S.-Latin American Relations Since 1889 (Lanham: SR Books, 1999), 71. For more information see Graham Stuart, “The Results of the Good Neighbor Policy in Latin America,” World Affairs vol. 102, no. 3 (1939): 166–70. For more information, see John M. Mathews, “Roosevelt’s Latin-American Policy,” The American Political Science Review vol. 29, no. 5 (1935): 805–20. Gilderhus, Second Century, 91, 98. Also see G. J. Dorn, “Pushing Tin: U.S.-Bolivian Relations and the Coming of the National Revolution,” Diplomatic History vol. 35, no. 2 (2011): 203–28. Kenneth D. Lehman, Bolivia and the United States: A Limited Partnership (Athens: University of Georgia Press, 1999), 62, 75. R. R. Trask, “George F. Kennan’s Report on Latin America,” Diplomatic History vol. 2, no. 3 (1978): 307–12. “The American Republics: Views Within the Department of State Regarding United States Policy Toward The American Republics as a Group,” 4 January 1950, Miller Files, Lot 53 D 26, in Foreign Relations of the United States, 1950: The United Nations; The Western Hemisphere, vol. II (Washington, DC: US Government Printing Office, 1976), 589–690. Gaddis Smith, The Last Years of the Monroe Doctrine, 1945–1993 (New York: Hill and Wang, 1995), 70. Robert L. Beisner, Dean Acheson: A Life in the Cold War (Oxford: Oxford University Press, 2009), 569. For more on US relations with Latin America during the Cold War, see Arne Odd Westad, The Global Cold War: Third World Interventions and the Making of Our Times (Cambridge: Cambridge University Press, 2007), 143–52. Herbert S. Klein, A Concise History of Bolivia (Cambridge: Cambridge University Press, 2003), 206–08. James Dunkerley, Rebelión en las Venas: La Lucha Política en Bolivia, 1952–1982 (La Paz: Plural, 2003), 67–69. Benjamin Kohl and Linda C. Farthing, Impasse in Bolivia: Neoliberal Hegemony and Popular Resistance (London: Zed Books, 2006), 64. Silvia Rivera Cusicanqui, Oprimidos Pero no Vencidos: luchas del campesinado aymara y quechua 1900–1980 (La Paz: HISBOL—CSUTCB, 1984), 122–23; Dunkerley, Rebelión en las Venas, 104–6. Memorandum by the Secretary of the State to the President, 22 May 1952, 611.24/5–2752, in Foreign Relations of the United States: The American Republics, 1952–1954, vol. IV (Washington, DC: US Government Printing Office, 1983), (hereafter cited as FRUS), 490. The Secretary of State to the Embassy in Bolivia, 8 September 1952, 824.2544/9–852:Telegram, in FRUS, 502. The Secretary of State to the Embassy in Bolivia, 23 December 1952, 824.2544/12–2352:Telegram, in FRUS, 516–22. Lester Langley, America and the Americas: The United States in the Western Hemisphere (Athens: University of Georgia Press, 2010), 182–83. Stephen Zunes, “The United States and Bolivia: The Taming of a Revolution, 1952–1957,” Latin American Perspectives vol. 28, no. 5 (2001): 33–49. Barrios de Chungara, Let Me Speak!, 51–52.